The Additional Qualification Tournament (AQT) for the EuroBasket Women 2011 will see ten nations fighting for the 16th and final place in the 2011 edition of EuroBasket Women in Poland. On the opening day of action Germany held off Belgium (69-57) with the duo Romy Bär and Anne Breitreiner scoring 14 points each. Hungary showed little mercy to the Netherlands and crushed them (68-39). Finland held their nerve down the stretch to beat Bulgaria (61-57) for the only surprise on the first day. Serbia led by 18 points after the first quarter and more or less had their game against Romania wrapped up by half time leading (53-31). Romania played better in the second half but were unable to trouble Serbia and ended up losing (64-77). Germany had the perfect start to the game with an 8-0 run to lead (10-3) early on and maintained control for most of the match despite Belgium drawing level on two occasions. Although Germany were much taller than their opponents and had a big advantage with the offensive rebounds, they were dependent on Romy Bär (right in picture - 13 rebounds), Anne Breitreiner and Lisa Koop who combined for 41 points. Lieselot Malfait and Noémie Mayombo scored 11 points each for Belgium. But poor free throwing and a lack of experience were to cost them dearly down the stretch. Germany put together a 12-0 run during the final quarter. This gave them a 14-point advantage (62-48) to seal the match with just under four minutes to play. Germany's head coach Bastian Wernthaler was happy with the result of the first game in the EuroBasket Women AQT. However he wants his team to carry on in the same way to go as far as possible. The suspense lasted just five minutes with Hungary in front (6-4). Hungary then stepped on the offensive accelerator and scored 19 points to open a 21-point lead with 11 minutes played (25-4). The Netherlands ended the onslaught with a couple of points from the charity stripes by Naomi Halman. However the match was as good as over by the interval with Hungary leading (41-17). Tijana Krivacevic (right) and Zsofia Fegyverneky had 13 points each while Orsolya Szecsi contributed 12 points as Hungary went on to win (68-39). The Finnish Wolves survived a nail-biting ending by Bulgaria to record a victory against Bulgaria (61-57). The teams went into the locker room tied (32-32). It was not until the 28th minute that Finland went in front for good (43-42). Finland had a maximum advantage of 8 points (52-44) with seven minutes left to play. Bulgaria started to chip away at the deficit. With just over a minute to play they just trailed by 3 points (57-60). The last minute was scrappy and a little uncontrolled. Bulgaria did not execute their last play properly and Doneeka Lewis (née Doneeka Hodges) was left no option but to fire a wild three-point attempt as the clock was winding down. Her shot was off target and Heta Korpivaara from Finland was fouled in the struggle for the rebound. She split the pair for the last score of the game (61-57). Taru Tuukkanen (above in picture) and Dionne Pounds scored 14 points for Finland while Zoia Stanoeva also scored 14 points for Bulgaria. Serbia had a great first quarter which included an 11-0 run that resulted in a (32-14) advantage. Serbia took their foot off the gas but still had a comfortable lead at half time (53-31). Romania played better in the second half of the match. Yet it was far too late to trouble Serbia. 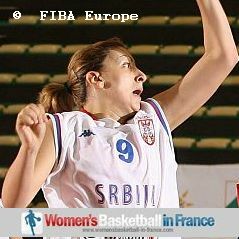 Jelena Milovanovic (right) compiled a double double of 18 points and 10 rebounds as Serbia won the game (77-64).